In a fluid the projectile fragments. Due to the trocar geometry of each petal the resulting diameter of the fragmentation pattern is maximized. The trocar tips allow the fragments to swim through tissue / gel with less resistance thus conserving energy. The cross sectional thicknesses and geometries also create a full 180 degree flip halfway along each of the 7 petals path. The resulting shock wave and wound path is maximized. The result is devastating. 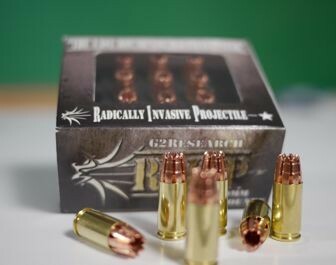 G2R's relentless study and applied physics have derived a radically invasive projectile that outperforms the rest.